Liposuction, a popular procedure for improving the shape of the body, is a minimally invasive process used to eliminate trouble areas where fat cells commonly accumulate, including the thighs, hips, belly, chest, neck, and arms. If you are thinking about having this procedure done, you might also be wondering whether to choose vaser lipo or laser lipo, which is also known as smart lipo. Both procedures offer advantages along with positive results, ultimately leading to a personalized decision which is made easier by comparing the differences between vaser lipo and laser lipo. Lipo procedures use either ultrasound or heat for fat emulsification to remove deposits that won’t go away with just exercise and diet. During emulsification, fat cells are melted, creating liquefied fat rather than solidified deposits. More specifically, the outer membranes of fat cells are disrupted as well, causing them to melt along with the fat and enabling easy removal. With Vaser lipo, ultrasound energy in the form of low-frequency sound waves is used to target and emulsify fatty tissues. An ultrasonic probe enters through a small opening on the skin so that the sound waves reach the fat cells. With laser lipo, heat created by small lasers is used to melt the fat. Each laser enters through a surgical opening of the skin in order to begin the process of liquefying the fat. Both methods of emulsification successfully achieve the desired results, allowing your doctor to remove the liquefied fat. One of the main differences between vaser lipo and laser lipo is the variation in tissues targeted by each procedure. Tissue selectivity is more precise with vaser lipo than with laser lipo. 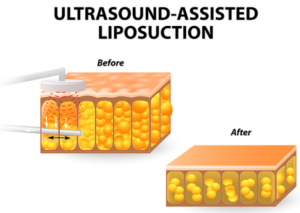 The ultrasound energy employed in vaser lipo specifically targets only fatty tissues in the treatment area. Therefore, skin, nerves, and blood vessels undergo minimal damage, resulting in little blood loss while removing fatty deposits. Only the fat cells undergo significant changes, allowing them to melt. Since the tips of the vaser probes are blunt, accidental damage to surrounding tissues is also highly unlikely. Laser lipo targets fatty deposits using laser frequencies emitted from a specialized hollow tubes known as laser cannulas. Some of the energy might harm surrounding blood vessels, skin, and nerve tissue, but this damage is usually minimal. The amount of blood that appears is usually more than you might see with vaser lipo, but it typically isn’t enough to be a medical concern. What Does Tissue Selectivity Have to do with Safety? Unfortunately, since the laser frequencies used in liposuction cannot distinguish between fatty deposits and other types of tissue, they can damage the skin, nerves, connective tissues, and blood vessels during the procedure. This issue arises because the fiber-optic lasers heat up at the tips only, so it becomes more difficult to avoid contact with non-fat tissues. The damage can occur no matter how experienced the doctor is, simply because the laser frequencies target every type of cell they come into contact with during liposuction. In fact, the damage can be as severe as it is to fat cells, particularly if the doctor isn’t licensed or does not have the proper type of experience. Evidence of non-specific tissue selection is seen within the substances removed once emulsification has taken place. Signs of blood and tissue might be present due to the fact that the blood supply to healthy tissues and skin might become disrupted. While the damage is typically minimal, this circumstance does increase the length of your recovery time. With vaser lipo, evidence of bruising is minimal due to the fact that only fat cells have been targeted by the ultrasonic energy. However, when laser vipo is used, bruising is generally more apparent since blood vessels, nerves, and skin have also undergone some damage along with the fat cells that were emulsified. While the concept of removing unwanted fat deposits from the body hasn’t changed all that much, the procedural options have. Today, fat is removed using mechanical manipulation, ultrasound energy, and laser technology. In many cases, a combination of techniques is used to enhance the results achieved through liposuction. Initially, cannulas with a width of 5mm were used in tumescent lipo, often creating uneven results due to their large size. Today, smaller cannulas offering a 3mm size are used, enabling physicians to deliver smoother, more attractive results with greater precision. Traditional tumescent lipo continues to use narrow cannulas to extract fatty tissue from the body. During tumescent lipo, your doctor inserts a cannula with a back-and-forth motion to mechanically remove fat from targeted areas. Prior to this step, a solution of local anesthetics and IV fluids is injected into the fat being targeted in order to numb the area, while also constricting blood vessels temporarily in order to minimize blood loss. During tumescent lipo, the patient is typically awake during the procedure. Laser-assisted lipo is often the procedure of choice for patients who desire removal of fat cells in narrower locations as well as in larger areas. Therefore, it works well for fat removal in small areas such as the neck or arms. It combines the heated melting of fat with its removal to sculpt the body into a more appealing shape. During laser-assisted lipo, general anesthesia is administered, allowing the patient to remain completely unaware of what is happening until after the procedure has been completed. The melting of fatty deposits enables easier, more successful removal. During this procedure, fatty deposits undergo melting prior to traditional lipo procedures. The idea is to ease the process, while creating a higher level of successful fat removal along with skin tightening, an add-on benefit of laser lipo. Since laser-assisted lipo aids in tightening the skin, it minimizes the type of dimpling that can occur after tumescent liposuction takes place, particularly in patients whose skin is no longer as supple as it once was. Known for its ability to permanently remove fatty deposits, liposuction is not without its disadvantages. While it has been deemed as a safe procedure for body contouring, lipo does include the use of minimally invasive steps, including skin incisions on each of the areas of the body being targeted, minor damage to surrounding tissues, and exposure to local anesthetics. The incisions are generally smaller with vaser lipo, creating less noticeable scarring during the early months of recovery. If you are looking for a completely non-invasive treatment that is FDA cleared for reducing stubborn fatty areas you should look into our Coolsculpting or Liposonix treatments. In addition to the incisions that are made, narrow cannulas are inserted into the body for the purpose of removing melted fat cells. Although the vaser probe is blunt and minimizes the risk of an accidental puncture, it is still considered to be an invasive step in the lipo procedure. During smart lipo, the tips of the laser filaments get hot during the procedure, increasing the risk of damage to healthy cells, particularly once the probe has been inserted into the body. Moreover, the tips are narrow and pointy, increasing the risk of harm. The size of the instruments used during liposuction can influence the recovery time as well as the results of the procedure. The cannula is the instrument used to remove the fat. Its size can determine the width of the incision, the smoothness of the results, and the extent of any bruising that occurs. Larger cannulas might extract larger quantities of fat and complete the liposuction process more quickly than smaller instruments, but they also lead to a higher level of pain, bruising, and bumpiness. Larger incisions also require stitches to ensure proper healing. Smaller cannulas deliver the flexibility of being able to enter narrow areas of the body for the purpose of extracting fat without the downside of creating unnecessary pain and/or bruising. Fortunately, modern advances in this type of technology have provided cannulas measuring 2.9mm in diameter, which is at least 2.1mm smaller than the original instruments. The probes utilized in laser lipo are slender and small, typically about the size of an IV catheter. Therefore, the incisions needed for insertion are small, enabling faster healing of the openings. When comparing vaser lipo vs. laser lipo, it is impossible not to notice that the results are similar in that both procedures effectively remove large fat stores and readily perform small to large body transformations successfully. Nonetheless, recovery time differences exist, specifically because laser lipo exposes a patient to more tissue damage risk, a fact that can lead to longer healing times. If and when this type of damage occurs, the patient’s recovery takes longer and is often more painful as well. Vaser lipo is designed to preserve the health of nerves, blood vessels and skin tissues, safely modifying fatty deposits without inflicting damage to surrounding tissues. Therefore, vaser lipo offers easy recovery with minimal downtime simply because only the fat cells were damaged. Bruising and swelling are also minimized, reducing the longevity of pain associated with this procedure. That being said, it is important to note that it is going to take each patient several days to two weeks to recover to the point where swelling, pain, and bruising have disappeared. When larger incisions are required, stitches are often needed to surgically seal the openings. On the other hand, if microcannulas are involved and incisions are as small as one-eighth of an inch, stitches might not be required at all to properly close the openings. Incisions typically close up in approximately one to two weeks, depending on their size. The speed with which the incisions heal is influenced by the care given to them post-procedure. Since vaser lipo requires slightly larger incisions, they tend to heal more slowly than the incisions made during laser lipo. Incisions generally heal completely without any sign of scabbing within four weeks’ time. While incision sites remain clearly visible for three or more months, they should become barely noticeable within twelve months. Whether vaser lipo or smart lipo is involved, most patients are up and about by the next day, depending on the extent of their fat removal. Pain, swelling, bruising, and discomfort can last up to two full weeks, but for many patients this type of soreness diminishes quickly. In extreme cases where large quantities of fat have been removed from several areas, the discomfort can last as long as four to five weeks. It is important to note that both vaser lipo and smart lipo offer faster healing than traditional liposuction. With the traditional procedure, patients were given general anesthesia, and it took longer for their bodies to recover from it. Local anesthesia has a smaller impact on the body, allowing it to heal more quickly than if a general anesthesia had been involved. Since local anesthesia is used during vaser lipo and smart lipo, the recovery period is shortened considerably, allowing patients to leave the doctor’s office within minutes rather than within hours. Vaser Lipo or Smart Lipo? Why? 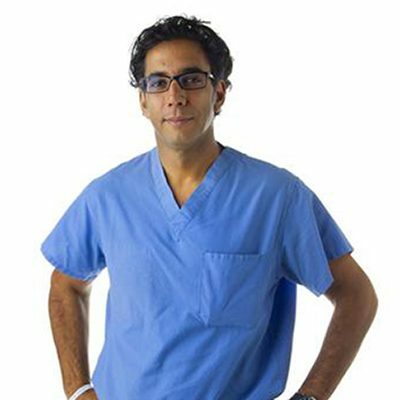 Dr. Daneshmand recommends vaser lipo as the more suitable option for most patients due to the advantages it offers as a minimally invasive procedure with a history of successful results. His recommendation comes from years of professional experience and familiarity with liposuction procedures, including traditional tumescent, vaser, and smart lipo. When comparing all aspects of vaser lipo vs. smart lipo, Dr. Daneshmand recognizes the benefits of choosing vaser lipo due to its less invasive nature, enhanced flexibility in achieving results, and ability to preserve connective tissues while destroying fat cells. It is a gentle procedure that delivers positive results without the type of tissue damage associated with more invasive procedures. Hold ctrl to select multiple treatments.